Research shows that water flossers may be much more effective than old-fashioned waxed string floss at maintaining healthy teeth and gums. 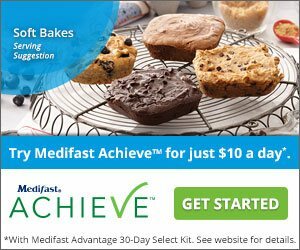 It’s time to make a change to a healthier alternative! 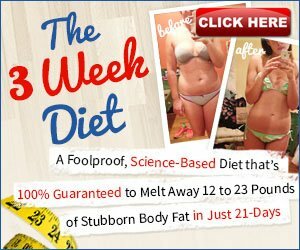 Click the links below to get started. Overall best water flosser ← Our top choice and #1 best seller! 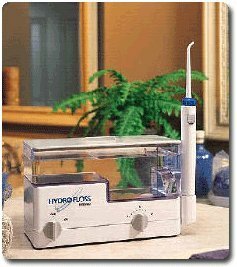 The first type of oral irrigators we will evaluate is the counter top plug-in full-featured water flossers. This category contains some of our favorite water flossers, including our top picks for the ultimate dental cleaning experience. Plug-in counter top water flossers offer the most options, choices, and dental cleaning power. Choose this type if you have room on your counter and want the highest quality water flossing experience. 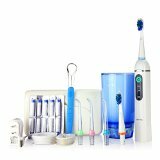 Our top three in this category are the Waterpik Aquarius, Waterpik Complete Care, and the Hydrofloss Oral Irrigator. The Waterpik Aquarius is at the top of our list, with the most features, great quality, and satisfied reviews. 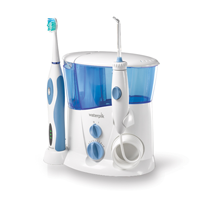 The Waterpik Complete Care is a great second choice because it has similar features to the Waterpik Ultra which was the previous top of the line Waterpik but includes a sonic toothbrush. (Compare the Waterpik Ultra vs. the Waterpik Aquarius here.) 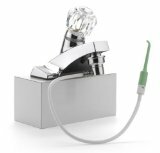 The Hydrofloss Oral Irrigator was chosen third because of its unique hydromagnetic feature, its ability to deliver medicated solutions, and overall customer satisfaction. The second type of oral irrigators we will evaluate is portable water flossers. This category also contains some of the best-selling top water flossers. Portable water flossers offer cordless convenience to the flossing experience. Perfect for on the go lifestyles or for when you don’t want the limitations of cords. The biggest advantage is portability and the biggest disadvantage is water capacity. Battery powered, yet fully featured, cordless water flossers offer a modern alternative to classic function. The third type of oral irrigators we will evaluate is sink faucet and shower-based water flossers. This category also contains some high-quality water flossers. Shower water flossers have the additional advantage of convenience as you can experience clean teeth and breath while showering. 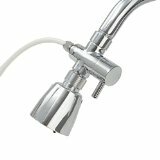 Sink faucet and shower water flossers attach directly to a pressurized water source, such as a shower head or sink faucet, using a special adapter. Because of this, no power outlet or pump motor is required. The cost is usually much lower as there are fewer moving parts to fail and they offer a only the essential water flosser tips and other components. How do I find the best water flosser for my needs? We’re here to help! This really depends on your personal desires and needs, naturally. However, we believe that our system of reviewing things and giving you the best options available will make this much easier. Above, you can see the top oral irrigators we found that we would recommend to people. There are more out there, but as of right now, we stand behind just those you see listed above. And of course, our personal experience and your feedback. Do not worry, though, as you will be well-served by any of the flossers listed here at Water Flosser HQ! What is a Water Flosser or Oral Irrigator? A water flosser is another name for an oral irrigator, which is a tool used to remove food stuck between your teeth. Like it says, its job is to floss, just like your standard string-style dental floss. Unlike dental floss, however, water flossers are easy to use, will not cut your gums, won’t cause bleeding, and are actually enjoyable to use. Find out more about water flossers. Who invented the Oral Irrigator? What are some common problems with water flossers? Most people seem to be pleased with their purchase of a water flosser. However, others are not entirely satisfied. Some of the water flosser problems the report are no different than for any product, such as: incompatible electrical outlets, delivery issues, and problems caused by customers not reading the directions or product description. By far most of the reviews are positive. Every once in a while, a defective unit is produced (as with any product). Rare defects that some report include: a dead unit out of the box, a motor that wears out too soon, or a handle that leaks or tube that breaks. Some complain about the noise of the unit. Overall, sometimes you learn a lot from negative reviews. Reading negative reviews can give you an idea whether a lot of people say the same problem, which may indicate a defective design, or whether it’s just the occasional defect or dissatisfied customer. 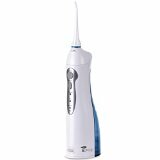 Since the vast majority of customers are satisfied with their oral irrigator and the rare negative reviews don’t show a clear pattern, you can be confident in you water flosser purchase decision. Are water flossers really more effective? It’s clear: water flossers are highly effective tools in promoting dental health! You can read about how to use a water flosser here. But rather than try to describe how a water flosser works, it’s better to actually show someone using a water flosser. We’ve pulled together a lot of information to help you find the best water flosser. It’s up to you to choose from the top picks based on what meets your needs, is in your price range, and will help you meet all of your dental hygiene needs. New flossers are getting put on the market sometimes by both new and long-time manufacturers. Because of that, the interactive guide above will be updated as new items get added to the marketplace (if they’re the best, of course). If you have an oral irrigator that we’ve missed, that you think is the best, let us know and we’ll take a closer look!